The True Face of Laos !! The True Face of Laos !!! 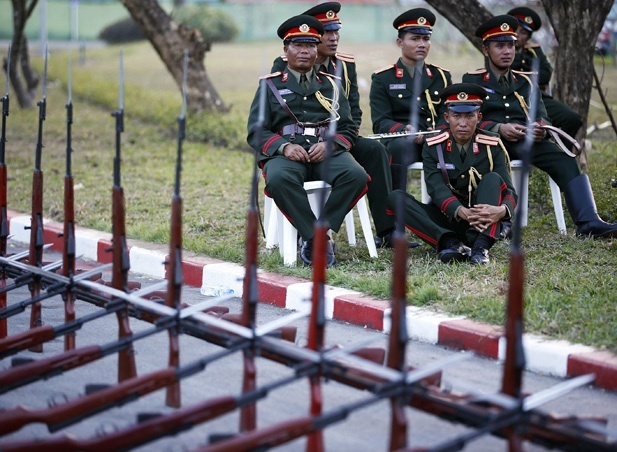 Laos honor guards and members of military orchestra sit behind guns as they prepare to welcome another foreign delegation arriving at Vientiane airport. The tiny country of Laos does not normally get much attention from policymakers or the international media, at least since the Vietnam War; but in Obama’s first term, the administration put a focus on Laos as one of the Mekong Region countries with which Washington would push for closer relations. This push came partly to reaffirm the United States’ presence in mainland Southeast Asia, which had diminished during the Bush administration, in part because of apathy, and in part because of sanctions and restrictions on relations with several Mekong nations. It also came partly because several Mekong region nations, including Laos, seemed increasingly uncomfortable with how dependent they had become on China for investment, aid, military-military relations, and diplomatic relations, and increasingly angry at China’s dams on the upper portion of the Mekong River, which were seriously affecting downstream water flows. Hillary Clinton became the first U.S. secretary of state to visit Laos in decades, the United States increased its aid budget for Greater Mekong nations, and it has boosted limited military-military contacts. In some ways, Laos has seemed to be opening up, consistent with the Obama administration’s beliefs that greater contacts with the authoritarian and long-closed nation would help integrate it better into regional organizations, global trade, and regional security apparatuses. Laos’ government has projected that its GDP will rise by a staggering 12 percent in 2012-13’s fiscal year, due in part to growing construction projects in the capital and other sites, new mining, and new hydropower plants. The country has aggressively courted investment from Thailand and other neighbors, and has been accepted for membership in the World Trade Organization. A small window of political and social change appeared as well: a popular Laos call-in radio show had begun broaching sensitive topics like land concessions and land grabbing, as well as the environmentally destructive aspects of some investments entering Laos. Vientiane elites seemed to be able to speak more freely about the government, and allowed several foreign academics to come lecture to local universities. But in recent months, it has become clearer that, despite the investment and better relations with the United States and other Western nations, the Lao government remains extremely opaque and paranoid about any domestic criticism. In fact, with Burma opening up, Laos is now the most closed and repressive state in Asia outside of North Korea. Last year, the call-in show, News Talk, was abruptly forced off the air. Then, in an even more shocking turn of events, in December Laos’ most well-known activist, Sombath Somphone, vanished. According to several news reports, he was held at a police post in the capital and then taken away in another truck which had stopped at the police post. Despite his high profile in Asia—he received the prominent Ramon Magsagsay Award for his community activism—his whereabouts remain unknown, even though, by the standards of political activism in neighboring states like Thailand, Malaysia, or the Philippines, he was hardly even critical of his government. Will Washington alter its rapprochement with Laos in the face of these disturbing events? Given that the administration has continued building closer ties with neighboring Cambodia despite the deteriorating rights climate there, it seems unlikely.